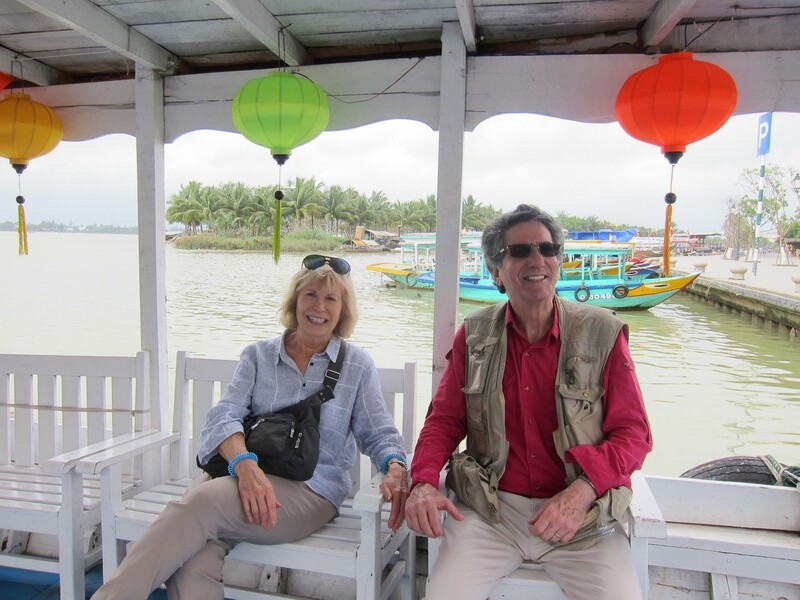 Thirty years ago, I stood with my husband on the banks of the Mekong River in Thailand, where that country comes together with Burma to the west and Laos to the east, and knew that we had to return someday, somehow, to Southeast Asia, to Vietnam. At the time, the U.S. embargo was still in effect, and travel was restricted. Over the years, we traveled elsewhere, but Vietnam remained atop our bucket list. The country, its people and politics and relationship to America had lived long in our brains. In many ways, the Vietnam era shaped our psyches. Our experiences, as for many of our generation, had a lot to say about who we are. Whether people fought in the war or against it, events of the era, as late brilliant writer David Lamb put it, signifies the time when we lost our innocence. My husband Jim’s family had served in the military, and he had considered going to college on a Navy plan that would have had him in Southeast Asia in 1966-67, using his language skills in intelligence work. Instead, he came under the influence of faculty who taught him, long before teach-ins, the sordid history of the French in Vietnam and the extent to which the US had been playing a not-so-subtle role there even in the 1950’s. His first anti-war demonstration was a protest against the Dragon Lady, Madame Nhu, who had come to the US in October 1963 to win public support for her brother, President President Ngô Đình Diệm, and his repressive policies shortly before his Kennedy-backed assassination. Prior to Vietnam, I, unlike Jim, had tended to trust institutional authority. I took our government at its word that it meant to do good in the world and would tell us the truth. Then it became increasingly clear they were lying to us. From Eisenhower to Kennedy, Johnson and Nixon, they were out to “win” even while privately acknowledging the war was unwinnable. Despite that certainty, they sent more than 2.7 million of our young (mostly) men to Vietnam, 58,000 to die there. Three million Vietnamese soldiers died, two thirds of them civilians; four million if you add in those who died in Cambodia and Laos. I won’t even go into relitigating that wrong-headed reasons that our government used to justify the war. Despite generations of strife and occupation, it is the friendliness of the Vietnamese people that impresses the visitor. Some have reflected that, well, the Chinese occupied Vietnam for a millennium, the French brutalized them for a century, and the United States was overtly there for just a little more than a decade. But it was a brutal decade, and the residue of what the Vietnamese call the American War (and others call the Civil War) is still present in the physical and mental disabilities caused by our use of defoliants like Agent Orange and the bodies maimed by land mines and cluster bombs. After the war ended in 1975 with a North Vietnamese victory, there were the dark years of a repressive Communist regime. Many of those associated with the south were shipped off to “reeducation” camps in the countryside. Since 1986, the government has allowed private enterprise, but democratic political gains have not kept pace with economic ones. Free market enterprise is everywhere you turn, from pig markets to restaurants to galleries and technology firms. Vietnam has become the world’s second largest exporter of rice and of coffee. Construction projects are everywhere, as are tourists, especially from South Korea, China and Japan. The same American government that had lied to those both supporting and protesting the war broke its compact with our vets, whose welcome home was anything but warm and who had to fight hard for benefits they deserved. VA Hospital waiting lists endure; Vietnam vets’ suicides persist, out of proportion to the general population. And from Iraq to Afghanistan we keep sending our young men and women off to die, in countries many can’t locate on a map, for reasons that are never made clear while the truth is never told. So off we went, on this my husband’s and my 40th wedding anniversary, which turns out to coincide with the 50th anniversary of the Tet Offensive, a series of battles that helped turn American public opinion against our involvement, as well as the 50th anniversary of the My Lai massacre this March. In upcoming blogs, I will reflect on how this history has evolved, the breathtaking beauty of Vietnam, the richness of its culture, the growing wealth gap of much of its population, and the complex spirit of its people today. This entry was posted in Uncategorized and tagged 50th anniversary of My Lai, 50th anniversary of Tet Offensive, Communist government in Vietnam, economic gains in Vietnam, Ngo Dinh Diem, protesting Madame Nhu, Trip to Vietnam, US Presidents lying about war, Vietnam in our psyches. Bookmark the permalink.